NRG Stadium in Houston, Texas will be hosting Super Bowl 51 or LI if you’re into Roman numerals. 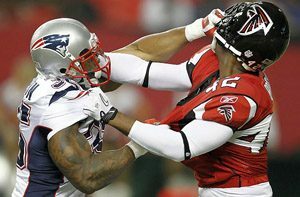 The big game takes place on February 5th with the Atlanta Falcons taking on the favoured New England Patriots. The Patriots were the League’s top performers this year with their 14-2 mark and topped the NFC East for a record eighth-straight time. The Falcons were kings of the NFC South with by going 11-5. The Falcons did away with Seattle and Green Bay at home in their playoff encounters while the Patriots blasted past both Houston and Pittsburgh, also at home. The Falcons have never won a Super Bowl and are 6-7 all time against the Patriots. New England is currently the three-point favourites entering the game. Bet on the game at 5Dimes! This is Atlanta’s second appearance in a Super Bowl in the club’s 51-year history. Their previous championship game came back in 1998 when they were beaten 34-19 by the Denver Broncos in Super Bowl XXXIII in Miami, Florida. Quarterback Matt Ryan led the Falcons past the Green Bay Packers last week quite easily with a 44-21 win and it looks like the high-scoring squad is going to be tough to stop. Ryan threw four touchdown passes in the NFC Final and went 27 for 38 for 392 yards. He also ran in a 14-yard TD on the ground as icing on the cake. Ryan continued to spread the ball around as he threw to nine different receivers during the game and Atlanta was up 24-0 by halftime. Wide receiver Julio Jones was the best of the receiving bunch though as he racked up 180 yards on nine catches. The Falcons have scored an average of 40 points in their two postseason games and gained more than 420 yards in each of them. They’ve also been successful on first-down conversions as they’ve posted a minimum of 28 of them in each of the two outings. The Atlanta defence is also stepping up at the right time by conceding 20.4 points against per game in the playoffs compared to 25.4 during the regular season. The Falcons’ defence forced a pair of turnovers in each of their playoff games and ranked 16th in the league in the regular season with a respectable 22 takeaways. On the other side of the coin, the Atlanta offence hasn’t turned the ball over once in their past four contests. In the last 15 Super Bowls, the underdog has managed to cover the spread and eight of those teams upset the apple cart by winning the game as well. In addition, New England has lost two of their past three Super Bowl games. The Patriots dominated Pittsburgh last weekend in the AFC Final to the tune of 36-17 at Gillette Stadium. New England has now played in six straight AFC Championship Games and managed to win three of them. The club is now hoping to win its fifth Super Bowl title in its NFL-record ninth appearance. Their last championship came two years ago when they beat the Seattle Seahawks 28-24 at Super Bowl XLIX in Phoenix, Arizona. The team has also been to the Super Bowl seven times since head coach Bill Belichick took over and Tom Brady has been the starting quarterback. The 39-year-old Brady probably won’t get the league MVP award this season though as that’s likely to go to the Falcons’ Ryan. However, Brady still has the experience and skills to lead his team to victory. He had arguably his best playoff game ever last week against Pittsburgh by completing 32 of his 42 pass attempts for a franchise and personal best 384 yards. He also added three touchdown passes and has now passed for at least 300 yards in the playoffs an NFL-record 11 times. He’s also just one of two quarterbacks to throw three touchdowns in nine postseason outings. Joe Montana is the other. Like Ryan, Brady also connected with nine different receivers last weekend and two wideouts gained at least 100 yards. Julian Edelman gained 118 yards on eight receptions along with a touchdown and Chris Hogan had 180 yards and a pair of scores on nine catches. With both teams being so good offensively, fans could be treated to a shootout on Sunday. But don’t forget the New England defence is hard to score against. That was evident last week when Pittsburgh was held to only 2.7 yards a carry on their 20 rushes. The Steelers also managed just one touchdown and that came in the game’s final three minutes. New England will need to contain both Devonta Freeman and Tevin Coleman this weekend though and that could be a tough task.